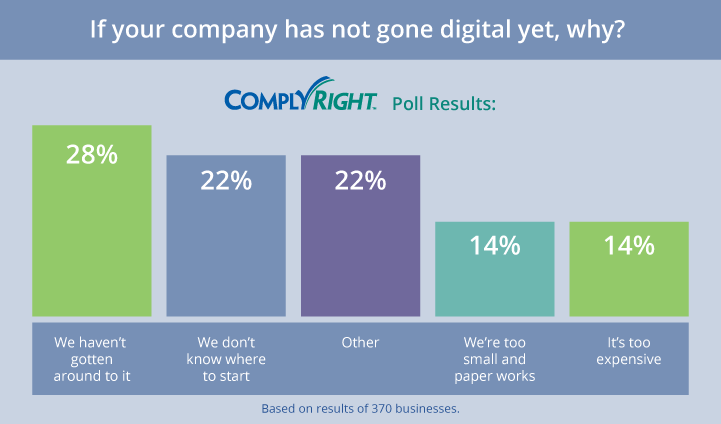 Is it Time to Make Your Employee Personnel Files Digital? 1) Are you and your supervisors buried in piles of paper documents and folders? This is a matter of volume. If you’re feeling overwhelmed by a seemingly endless flow of paper, it’s time to look for options. It’s one thing to manage paper if you’re a start-up business of one or two partners but quite another if you’re a growing business with a full staff. 2) Are you wasting precious time hunting down lost or misplaced documents? For all of the times you’ve spun your wheels looking for a specific file or folder (or even a handwritten note), you could be crossing more pressing items off your to-do list. Add up all those time-draining sessions from day to week to month, and it’s easy to see paperwork’s impact on workplace productivity. 3) Is there a lack of coordination between different teams or departments in your workplace? Old-fashioned paper documents — and even email — aren’t the quickest or easiest ways to distribute information. Placing important documents in the cloud makes them accessible to permitted individuals, any time, anywhere. 4) Are your critical documents exposed to potential theft or damage? The creation of documents — Establish some guidelines on what key documents should include, and how they should appear. Professional templates, standard forms and an in-house style guide can help in this area. The filing of documents — In addition to setting up a consistent naming convention for current files and folders, examine your paperwork at least once a year to clean it up and weed out old files. The storage of documents — Until you can take full advantage of cloud storage for ultimate security, you’ll want take precautions with physical storage of non-digital files – from locking cabinets and offices to backing up computer files regularly and maintaining a secondary backup, ideally off site. It’s a smart business practice, too, to include a records policy in your employee handbook. A thorough policy should explain the types of records maintained in personnel files, the retention timeframes to satisfy federal requirements, and how records are stored to protect sensitive or confidential information. It is estimated that companies spend $20 in labor to file a document, $120 in labor to find a misfiled document and $220 in labor to reproduce a lost document. When you’re ready to take it to the next level and move your recordkeeping online, we can help. Start with our FREE Employee Records Smart App, which lets you consolidate employee information at your own pace, for immediate use with your current business practices. Then, as you get more comfortable with the process, you can go digital with other HR and employee-management tasks, such as tracking employee attendance, hiring new employees and disciplining current employees. Your Employee Records app provides a seamless link that lets you connect to other HRdirect Smart Apps as your needs grow. Still not certain if HR software is right for you? Check out this quick quiz to help you decide. A digital filing system is a method for automating and managing paperwork. Traditional paper filing is often time-consuming and inefficient. Cloud storage of important data is more secure than physical storage. By electronically filing their employee’s personnel records, employers can better organize and maintain essential data.